PITTSBURGH -- Defenseman Kris Letang will return to the Pittsburgh Penguins lineup Wednesday against the Detroit Red Wings (8 p.m. ET, NBCSN, TSN2), 10 weeks after having a stroke. "Kris has been cleared almost for a few weeks now to be back practicing with us with contact," Penguins general manager Ray Shero said. "The doctors had left it up to him when he felt he was ready to play and come back. Kris has been bugging me for a little while here to return to play. I talked to him on the road trip, talked to him again [Tuesday]. He feels real good on and off the ice, so he'll be back playing this evening. "I'm excited for him because I think the main thing is health-wise he feels good, and everything is trending in the right direction for him short term and long term." Shero said it had been up to Letang and his medical team when to return, and said the decision was made Wednesday morning. "I think it was a decision between me and Ray," Letang said. "We've been chatting for the past few weeks." Letang has been out since he had a stroke Jan. 29. Further testing revealed a small hole in his heart that had been there since birth and could have been the cause of his stroke, but it has not been repaired. "Hockey did not cause the stroke," Shero said. "Resting is not going to make him better. … To return to play ice hockey, he's at no further risk to suffer a stroke than he would be going to the grocery store." Shero said Letang still experiences dizziness and headaches. He said Letang has dealt with those symptoms throughout his career and called it "the new normal," which Letang repeated. "That's the new normal and I feel 100 percent in it, and that's why I've been skating," Letang said. "I have the green light, but I've been skating a lot just to see if it would happen on the ice but it did not." After being cleared to play, Letang said his family was frightened at the possibility of him having another stroke but said his level of play not meeting his expectations is the only thing that makes him nervous. "[My family is] scared, but at the end of the day we made sure with the doctor that I wasn't running a risk going out there," Letang said. "I just made sure they understood the situation. I had some doctors talk to my family to reassure them. "I'm nervous. It's been a long time without playing, but about my situation, not at all." Even the opposition is looking forward to seeing Letang return. "You have to be real excited for him and his family," Red Wings coach Mike Babcock said. "As much as we're all competing against one another, he's been a competitive, good player in this League, and when that [stroke] happens you're just cheering for him that he's going to get, No. 1 his family life back and No. 2 his game back, which he loves. So it's great to see him here [Wednesday]. I think he should get a warm ovation, obviously, from the crowd and I just know that as a competitor against Pittsburgh, we'll be thrilled to have him back." Letang, 26, had been on blood thinners since he had the stroke but had been taken off them when he returned to practice March 17. At that point Letang said his goal was to return at some point this season. "There's no doubt in my mind," Letang said that day. "Even the day I got the stroke, I asked the doctor when I'm going to be able to play again. So there's no doubt about it. If I'm on the ice today it's because I want to return." Coach Dan Bylsma said Letang will be partnered Wednesday with Rob Scuderi. Bylsma said it's a pairing he's been hoping to use all season, but injuries to each player prevented it. Scuderi said he isn't concerned about Letang's conditioning because "he could sit for a year and look fine." "It's an incredibly serious injury and something I'm sure he'll have to be aware of for the rest of his life," Scuderi said. "But as long as the doctors have given him the clearance … it seems like he's taken a barrage of tests and I'll be glad to have him back. It's a big thing to come back from." 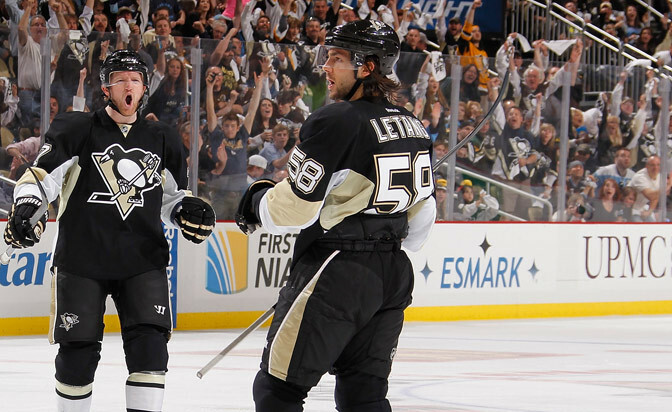 Bylsma said Letang will play on the Penguins' second power-play unit. The Penguins, who have more than 500 man-games lost to injury, now have nine healthy defensemen. Defenseman Paul Martin, who recently returned from a broken hand that sidelined him for 19 games, said he thinks Letang's addition will help with Pittsburgh's puck possession. "I'd like to think, for us, hopefully we'll spend less time in our [defensive] zone," Martin said. "I think the team has done great even without us for a long time. 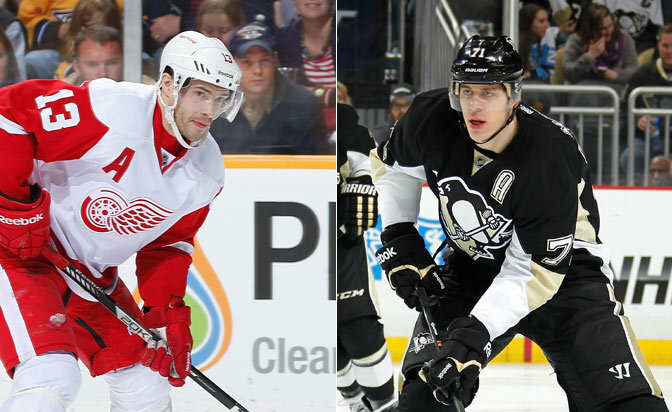 I think the biggest thing is that hopefully we'll be spending less time in our own zone." Defenseman Matt Niskanen echoed Martin's sentiments. "He's our most talented defenseman," Niskanen said. "His strengths play right into how we want to play and immediately it's going to help us in the things we've been struggling with. Getting out of our zone quick is the biggest thing. Some of that is breaking out with the puck on our stick clean. "Kris is a pretty good defender. He can man-handle people in the corners and he grabs the puck and he's heading the other way." Letang was a Norris Trophy finalist last season, but this season he has 10 goals and eight assists in 34 games. He missed the first nine games of the season with a lower-body injury and another 26 after the stroke. "I guess when a person comes back from a shoulder injury you see him take a first hit and you're a little nervous about that. I don't feel that way about Kris coming back," Bylsma said. "However, this is a traumatic experience for Kris. He's gone through a lot in the last two months emotional-wise and for him to be able to come back and play, there are some emotions. "I don't think it's nervousness. We're not scared. But I'm definitely going to have some emotion seeing him play [Wednesday]."